Another cigar I have been looking forward to trying out was the Leccia Luchador. With the weather dipping into the 80’s due to the last 2 weeks of rain, and a free Sunday I ventured out back to fire this Mexican-themed cigar up. The Luchador is offered in 4 sizes: El Hombre (5×54), El Castigo (6×60), El Guapo (6×50) and Loco Perfecto (6×58). They are packaged in boxes of 21 ranging from $8.10 to $8.60 a stick. I ordered these over at cigar.com and they have been available at retailers across the United States for a while now. For more information you can follow Sam Leccia on Twitter and Facebook. Prelight: Leccia’s Luchador is a pretty little thing. It starts out with an absolutely beautiful dark brown wrapper. 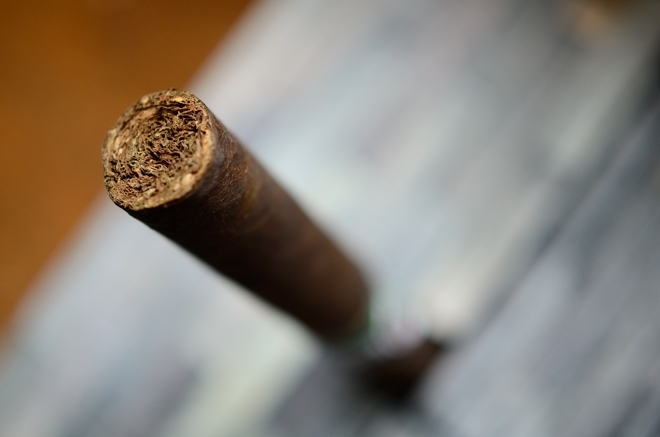 The wrapper color is very consistent with only a few darker areas around the foot and the cap of the cigar. The wrapper carries a very toothy texture with one or two larger veins running throughout the body. The wrapper leaf is very thick, and laid seamlessly as it leads up to a round, double cap. The construction on this bad boy is top notch. The Luchador is finished off with a very fitting Luchador style mask for a band sporting the Mexican flag colors Red, White, and Green with some black and gold detailing. Being so close to Mexico Luchador wrestling is something that we see on a weekly basis here. The Wrestlers are celebrated, and are just as big of celebrities as their American counter parts. This cigar fits right at home here in El Paso. 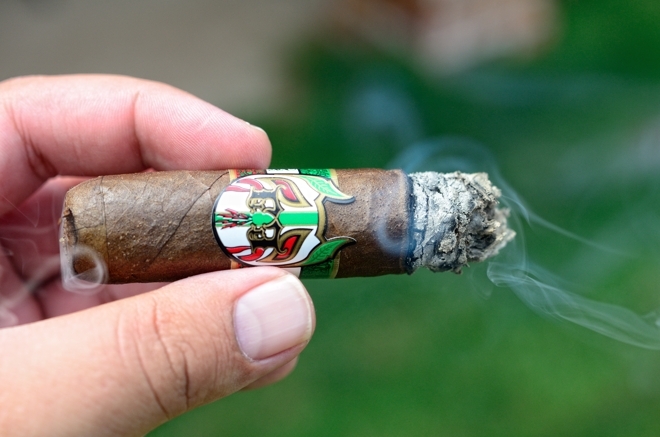 The wrapper of the Luchador gives off a very strong, pungent tart and cedar aroma while the foot of the cigar is a bit on the mild side only releasing some mild grassy, mossy aromas. The cap very clean, and very easily using my double bladed Palio cutter. The cold draw started out with some strong spice backed by a really doughy profile with a bit of tobacco mixed in there. First Smoke: Wow. The Leccia Luchador starts out with a huge black/cayenne pepper greeting. It was strong enough to bite the tip of my tongue and the back of my throat a bit. The pepper began to subdue a bit and some strong cedar, spice, syrup, tobacco, and tartness started to seep through. The draw on the Luchador is spot on. Each little puff kicks out a massive cloud of thick, white smoke. Surprisingly, there isn’t a lot of stationary smoke coming off this cigar as it sits in my ashtray. 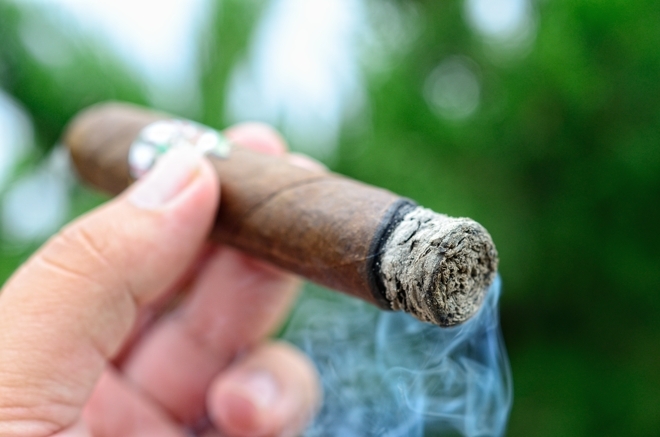 The burnline has a few waves which is normally expected when you have a cigar packed with crazy burning ligero leaves, but it’s nothing too crazy. The ash left behind is a light gray, and very tightly compacted. It held on for well over an inch before falling into my ashtray. 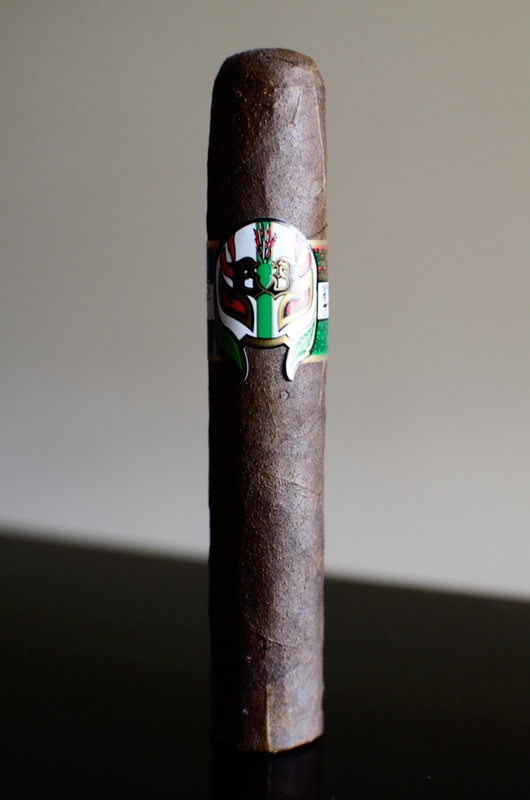 Halfway There: One characteristic that Ligero always leaves me with is a bit of a charred, smoked meat flavor and I am picking up a ton of it into the second third of the Leccia Luchador. Along with the charred/meat flavors I am picking up more of the tartness from the San Andreas while the pepper is finally started to fizzle out. There is still a lot of small spice notes, and a ton of cedar. The retrohale is way sharp and much too peppery for my liking. I’ll stick to the old fashioned way of smoking. The burnline is still a bit wavy and I had to correct a real large wave, but it wasn’t anything too crazy. Again, you gotta expect that when you are smoking a cigar packed with Ligero. The strength of this cigar is already showcasing just how strong this cigar is leaving me with a nice little nicotine kick as I close out the second third. Finish: I had to really pace myself with the Luchador. 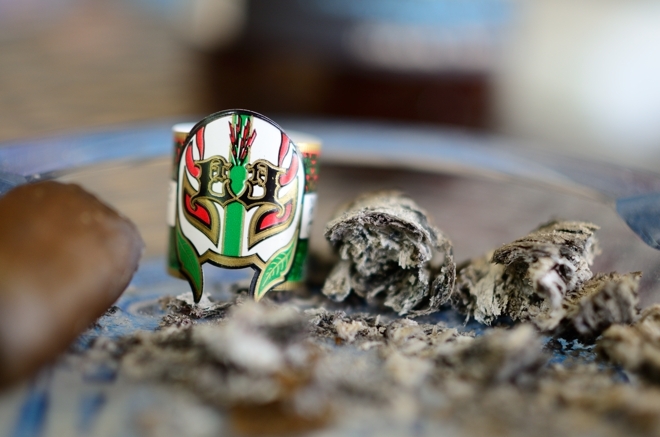 Maybe it was me, my mood, my food consumption, or maybe the cigar itself, but the Luchador has delivered in the boldest way possible in terms of strength, and I have been loving every minute of it. 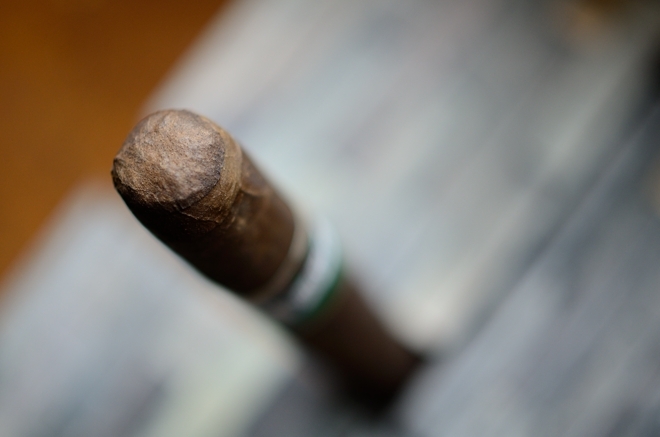 The charred flavor began to repress as the ligero flavors became much more of strong tobacco. The backing flavors were syrup, tartness, and lots of spice with a bit of espresso mixed in into the final third. There is no doubt that this is a full-strength, full bodied experience but I never once felt that one was overpowering the other. Even into the final inch the Luchador was well balanced and just overall complex and bold. After that touchup in the second third the burnline finished clean with some slight waves, but didn’t require any further torch attention. It took me about an hour and a half to take the Luchador down while it left me with a pretty high nicotine kick. 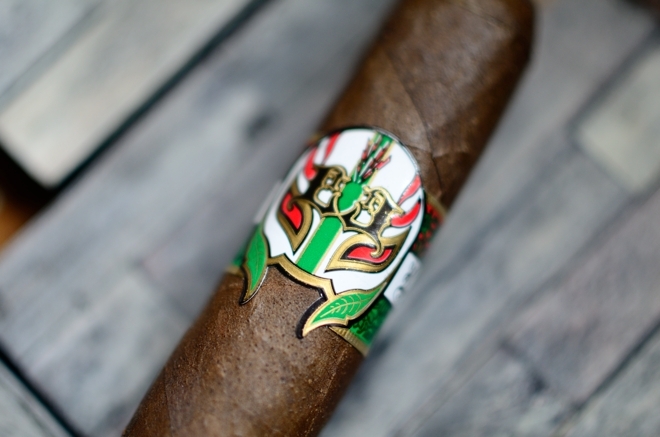 Overview: It’s been some time since I’ve had a cigar that has both been incredibly strong, and incredibly balanced like the Luchador. Lots of flavor, lots of strength, and lots of love. The cigar leads off with strong pepper, spice, and tart while it finishes with some bits of espresso, syrup, and cedar. 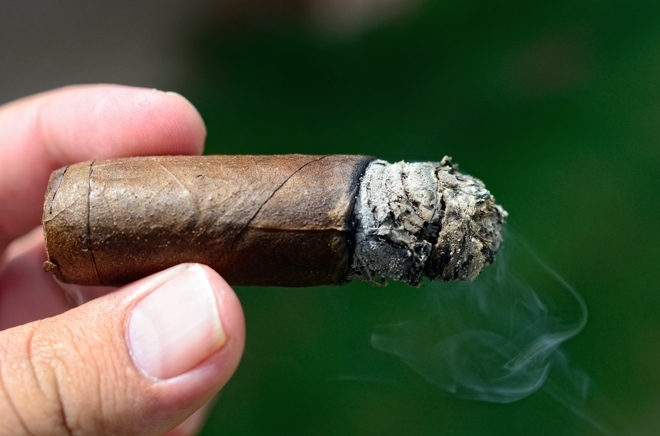 It’s not really a novices cigar as it may be a bit too strong, but I think this cigar is perfect for someone like me, a seasoned cigar smoker who loves stronger, complex experiences. The price point is right where it should be and I even got these on a crazy sale averaging a little of $4 a stick. Box worthy for sure, and a perfect after dinner/late evening cigar. I wouldn’t recommend smoking one on an empty stomach or first thing in the morning. 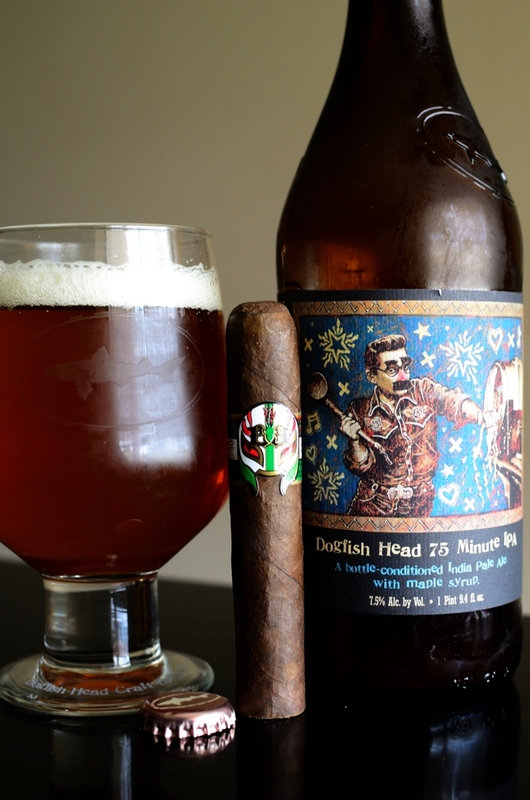 Pairing: Dogfish Head’s 75 minute IPA is an IPA brewed with maple syrup and continuously hopped for 75 minutes. Coming it at 7.5% ABV this beer resembles a perfect hybrid of a sweet IPA, and a sour. The balance is incredible as the beer leads off with some strong sweetness, syrup, and hoppy citrus finishing with a nice sour bite. The syrup is what sold me on this pairing and I had no idea the sourness would meld with the charred and tart flavors from the Luchador as well as it did. Love the Luchador. I think Sammy hit a home run with this one. I agree with you Troy. All of his releases under Leccia Tobacco have been great so far. I love that swirling smoke in the halfway pic. 🙂 That is such a great band.